Kim Kei has a Dr. Frankenstein approach to creating her art. Whether rescuing it out of the gutter or creating it in her studio, she manipulates otherwise forgettable detritus with fabric and paint, molding it with wax and glue and fibrous material, so that the piece holds its wrinkles and twists. Stiffening into a sculpture, it hangs on a wall, is photographed in intimate detail, or used as a print-making device. 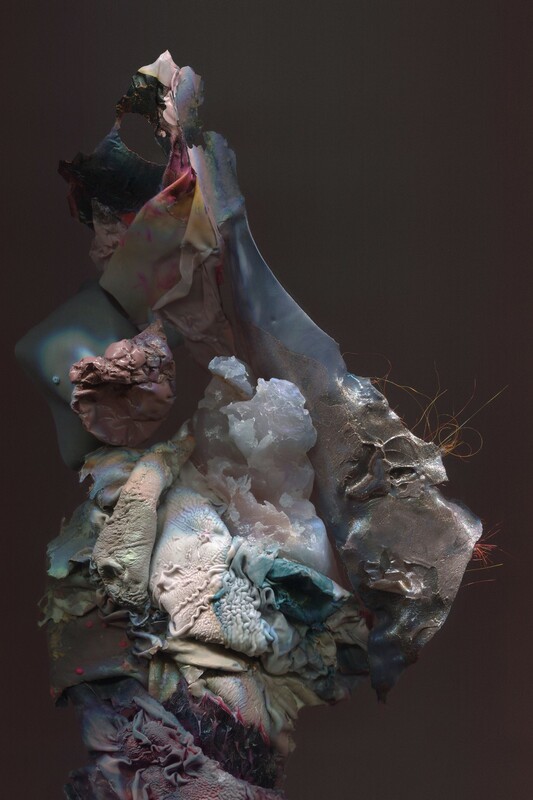 While there is an obsessive similarity to the work, uniting pieces regardless of the medium Kei is using, each sculpture has its own personality—especially when photographed­—creating intermittently striking biomorphic images. For every unspecific smidge or unmemorable paint blot in her solo show at Irvine Fine Arts Center, “You Have No Sound,” there’s something that catches and hooks the eye, looking reasonably like an arachnid, the profile of a face, a shiny chrysalis, or a mangled rotting limb (the mottled blues and grays in Waking resembling the lividity that settles into a corpse). Don’t trust that last grotesque description as anything at all reliable about what Kei is doing, by the way. Her work is resistant to specific narrative, open to interpretation at the same time avoiding it altogether, so any real ability to decipher something is just your mind in overdrive, trying to make sense of the enigmatic. Not that there’s anything wrong with standing, staring and letting your mind free associate. A host of things will jump out, if you do: viscera (the digital C-print Mimesis 11), flowers, placentas, sea creatures, but mostly, it’s just skin. Peeled, flaking, flayed-open horror show strips of flesh. Ripping away the body’s protective layer, Kei exposes the sensual body underneath, nerves exposed, minus their protection, the hidden vulnerable to invasion by infection; a symbolic, voyeuristic experience for anyone that looks at it. Begin by walking through the first couple of galleries to the black box at the rear of the Center. Devoted to the artist’s process, The Project Room has preparatory sketches, unfinished work notes scribbled on the walls, and torn photographs as symbols of frustration or ripped to focus attention on an image that inspires. Reveling in the unguarded openness of the room, bits and pieces of Kei’s art that have yet to make up their mind whether they will be interesting or not, are in a state of flux, the grotesque formations already sculpted with an intense rawness that makes them feel disconcertingly alive. Kudos to curator Yevgeniya Mikhailik for opening up the solitude of the artist’s studio, a place of success and failure where work is destroyed or dismissed before it ever sees the light of day. It’s a gracious, vulnerable act on Kei’s part, putting work on display before its time: it includes the audience in the procedure, demystifying and making accessible work that might otherwise be too difficult to parse by oneself without knowledge of the course it takes to get there. Back to the first gallery, the photographs of her sculptures resemble the musculature of athletes or dancers in motion. Photographed with an aesthetic similar to the shopping bag whipped by a whirlwind in Alan Ball’s film American Beauty, Kei captures the loveliness hiding in something we wouldn’t usually look twice at. 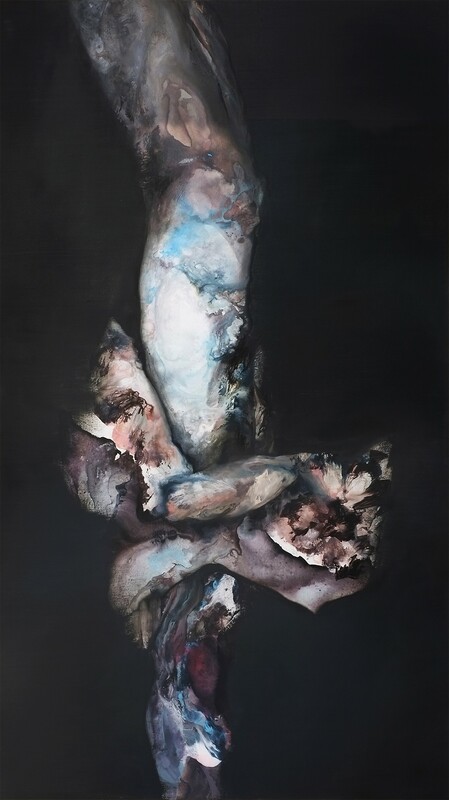 Against a black tenebrist background, the colorful details, minute fabric hairs, and brushstrokes of paint magically pop in the series of monographs, the blues and pinks of viscera pirouetting to great effect, like gutted ballerinas wrapped in garbage (No Longer Anything Else). 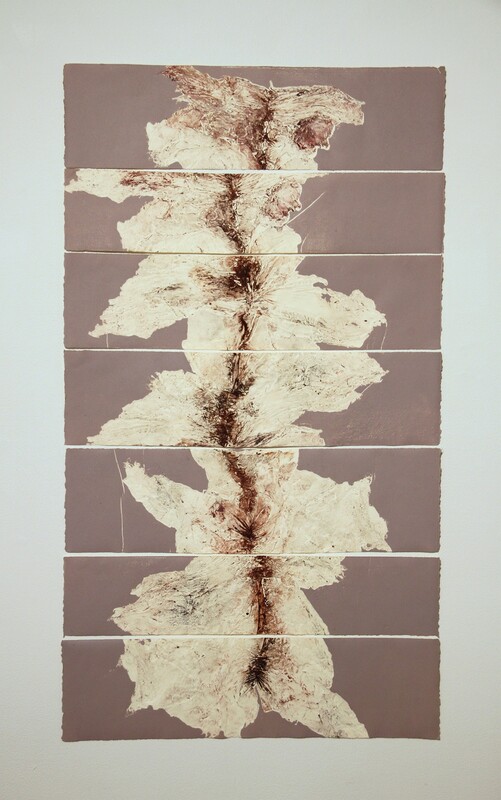 Handmade prints attached to the wall, nearby, embrace the natural creases and folds in the sculpture and paper, staining the canvases like dead leaves that leave a ghost image after they’ve had time to decay on a sidewalk. In others, the impressions look as if someone with burned skin—collapsed, wrinkled and scarred—laid their face against the paper, the effect off-putting, even stomach-turning at moments, the step back and look of disgust on your face a natural reaction to the surprise of unwittingly seeing a traumatic, open wound. Kei creates multiple prints, cuts them into pieces and reassembles them into larger works (again channeling the assemblage skills of Mary Shelley’s anti-hero). A cross between the trunk of a ragged palm tree and the sharp edges of shattered reflective glass, Of Their Own Parting is mesmerizing; opened like a card in front of you, it’s a floor-to-ceiling-high Zen puzzle as you try and contemplate the original order of the pieces. Using the things we throw away to represent our bodies, Kei gives us distance, but also reinforces the idea that the abstract, long used by artists to avoid reality, can bring us closer to a poetic understanding of their subject. Taking sublimated ideas of self-hatred, body shame, the precarious relationship that each of us has with the skin we’re in, Kei carves it open, exposing that toxicity to the air, simultaneously finding value and a dignified beauty in our mutual ugliness. “You Have No Sound” at Irvine Fine Arts Center, 14321 Yale Ave., Irvine, (949) 724-6880; www.cityofirvine.org/irvine-fine-arts-center/current-exhibitions. Open Mon.-Thurs., 10 a.m.-9 p.m.; Fri., 10 a.m.-5 p.m.; Sat., 9 a.m.-5 p.m. Through Aug. 12. Free.